Elk were a common sight in the southern Appalachians and elsewhere in the eastern US until the early 1800’s. 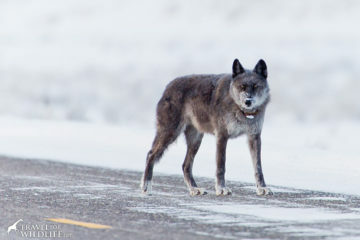 Due to habitat loss and over-hunting they were eliminated from the east coast. By 1900, the elk population in the United States reached such a low point that conservation organizations and hunting groups believed the elk would become extinct in the near future. 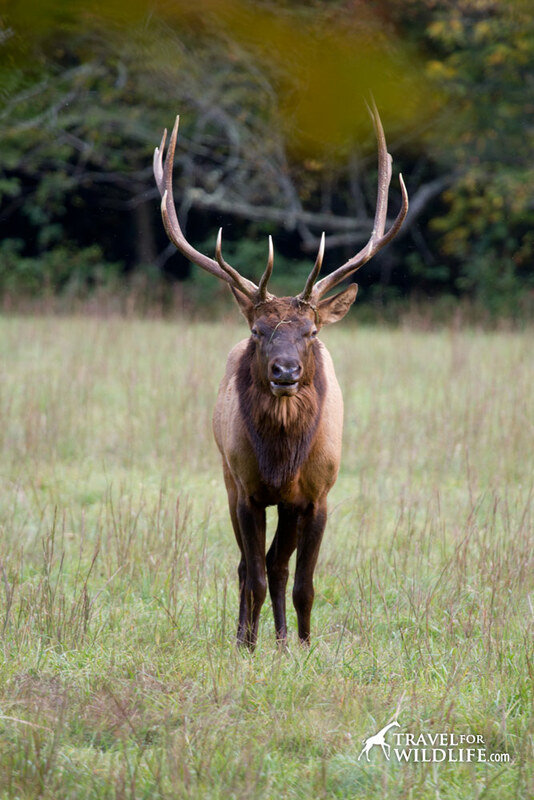 In 2001 the Great Smoky Mountains National Park (along the border of North Carolina and Tennessee) began a five-year experimental release program to determine if elk could be successfully reintroduced. 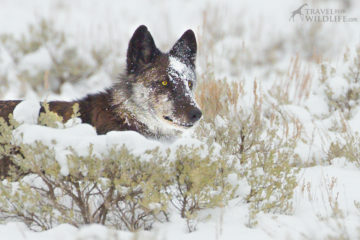 The program started with the reintroduction of 25 individuals followed by another 27 in 2002. In July 2012 the elk population in and around the Smoky Mountains was up to 140 individuals. Where do the Elk in the Smoky Mountains Live? 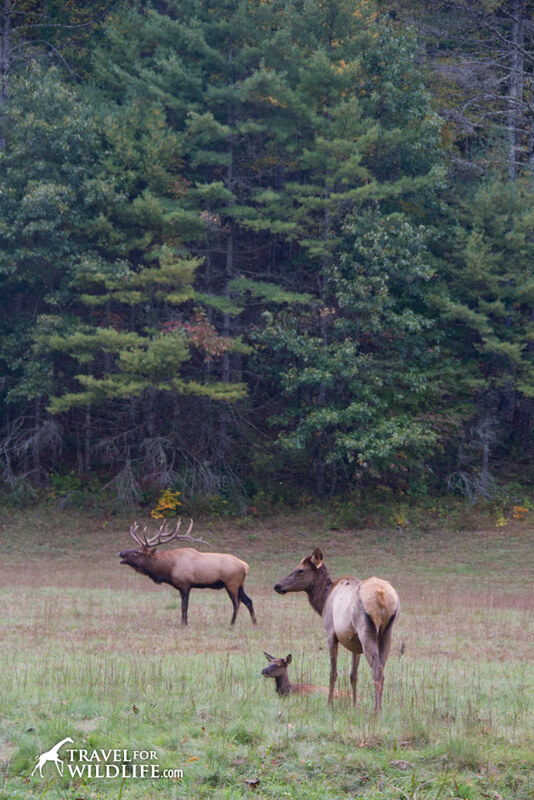 Most of the park’s elk live in the Cataloochee Valley area, on the east side of the park. Elk are best viewed at a distance in the early morning or late evening when they move into the fields to feed. 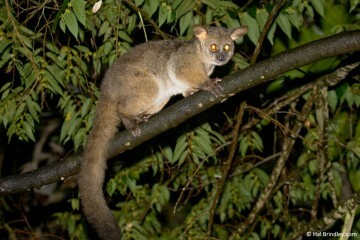 During the hot parts of the day they hide in the forest and are not easy to view. 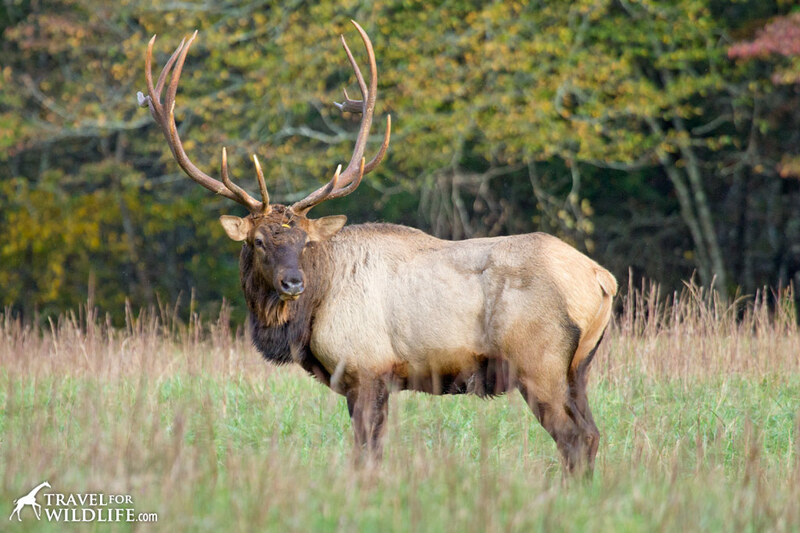 There are different things to take into consideration before visiting Cataloochee to see the elk, such as weather conditions, elk behavior and ecology. 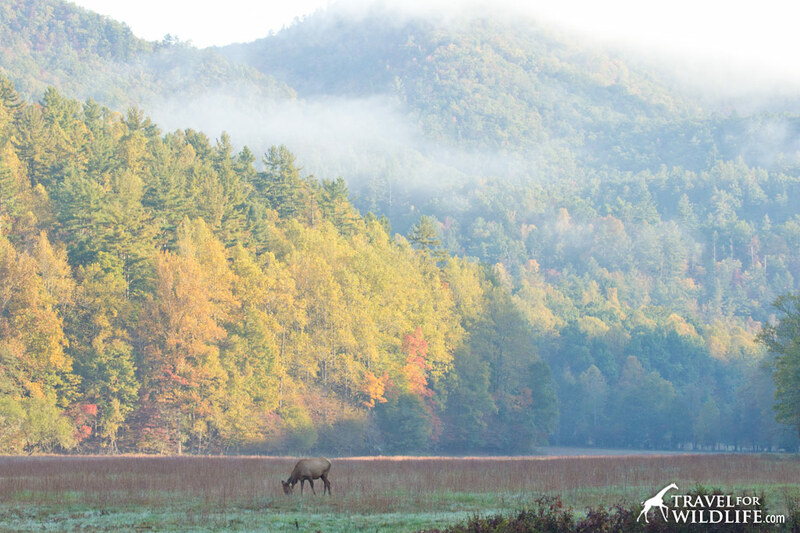 The best time of the year (and the most crowded with visitors) to see elk in the Smoky Mountains is the fall. During the rut season, male elk present the biggest antlers and it is during this time of year when bulls challenge one another while fighting for dominance of a territory and females. This is the perfect time to hear elk bugling: the strange screechy call that males make to proclaim their territory. Have you ever heard a bull elk bugle? It also during the fall when rich foliage colors make for great photo opportunities. Spring is a good time to visit as the visitor number is still low. Bear in mind that elk drop their magnificent antlers in March and big bulls are not fighting for dominance so spring might not be the most exciting time of the year. If you visit the park in spring, look for the wildflowers of the Smoky Mountains. Early summer gives you an opportunity to see the little ones. They are usually born in early June. In Winter, elk are less visible and it is likely that the road to Cataloochee is closed due to snow anyway. Do not approach elk within 50yards. It is illegal and you will be fined (and can even be arrested for it). Do not enter the meadows where elk are resting. It is prohibited during calving and rutting season. 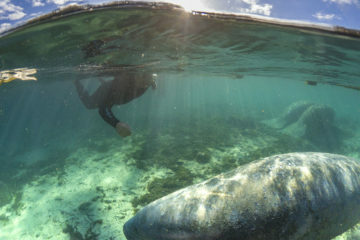 Do not get in between a mother and a calf. She might charge you to defend her calf. Do not approach elk during rutting season in the fall under any circumstances. Elk may perceive you as a serious challenger to their territory and charge after you. 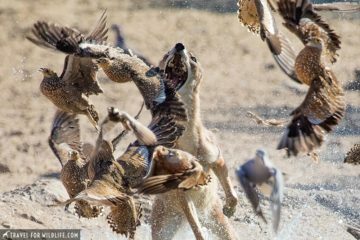 Males are big animals and can be dangerous. View elk from the road. Use binoculars or spotting scopes for close up views. 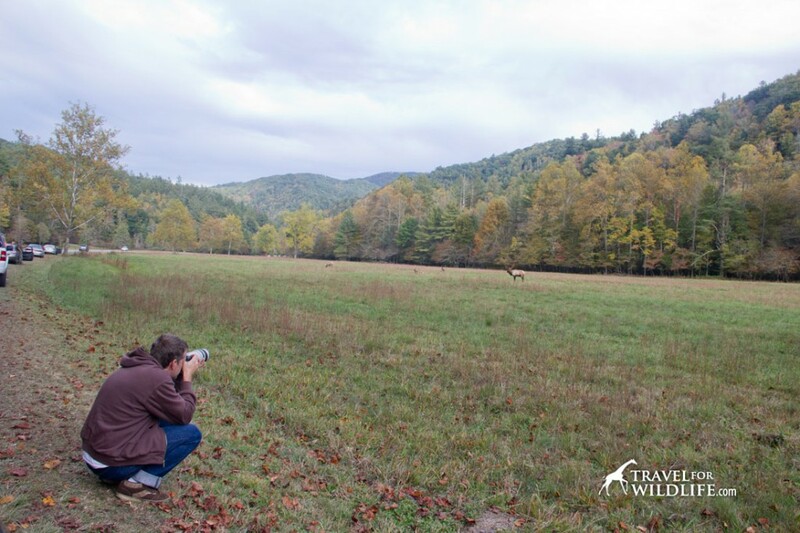 The elk is not the only wildlife that you can see during your visit to Cataloochee. 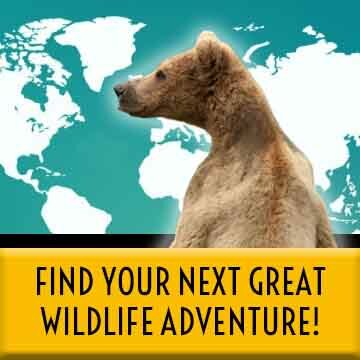 Black bears: there are two black bears per square mile in the Smoky Mountains. 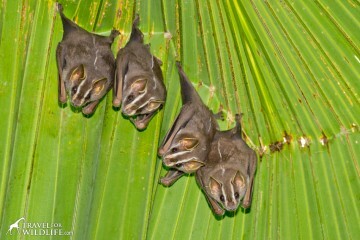 They are often seen feeding on the apple trees in the Calalochee meadows in fall. 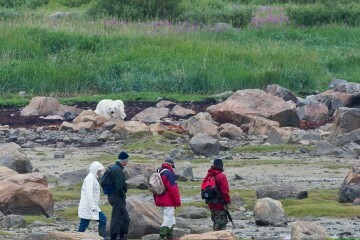 We had a black bear cross the path right in front of us once. Wild turkey: we see great numbers of them almost every time we visit Cataloochee. Red squirrels: the Smoky Mountains are at the southernmost point of red squirrel range in the Eastern United States. Salamanders: you are in the salamander capital of the world! There are 24 species of salamanders found in the Great Smoky Mountains National Park. Monarch butterflies: in the fall you can see the monarch migration right here. Last time we visited in the fall we saw a bunch of monarch butterflies flying south on their way to Mexico. Synchronous fireflies: their peak season is from the third week of May to late June. Best viewed along the meadows during dusk. 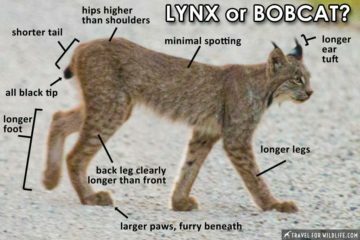 Other: coyote, bobcat, 11 species of bats, wild European hog and great horned owl. If you want to see the deer in the Smokies, your best bet is to head out to Cades Cove, on the western side of the park. You won’t see white-tailed deer at Cataloochee. There are no lodges in the Cataloochee valley. The only form of accommodation available is the Cataloochee campground. 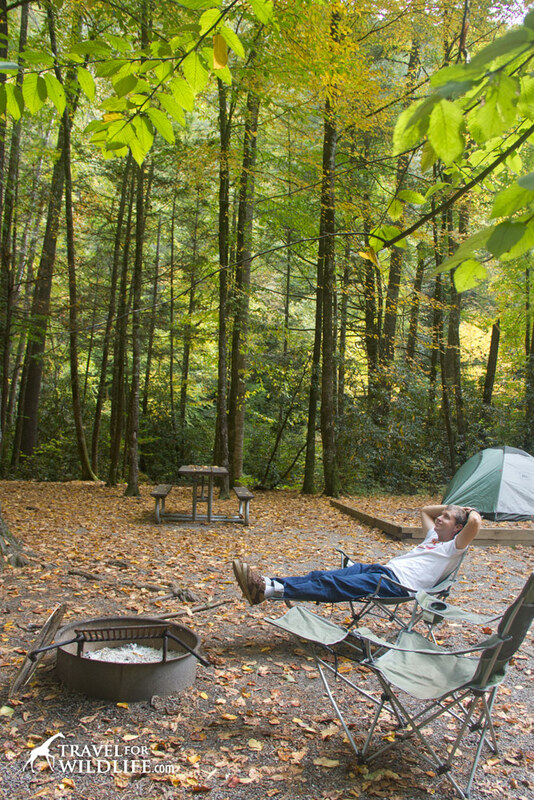 While other campgrounds in the Smoky Mountains are open all year round, the campground at Cataloochee only opens seasonally, from March through October. You NEED to book your campsite at Catalooche before arriving, and don’t try to book by phone once you get there because there is no phone signal at Cataloochee. You won’t get a site if you don’t have a reservation. 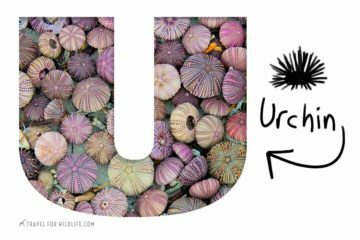 If you bring firewood, make sure it bears the USDA certificate. 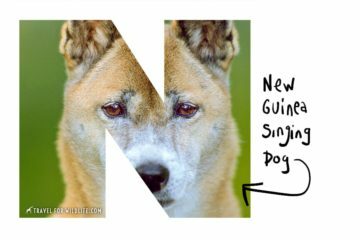 It prevents any disease to get into the park’s trees. It may seem too much trouble to try and camp here but it is well worth it. 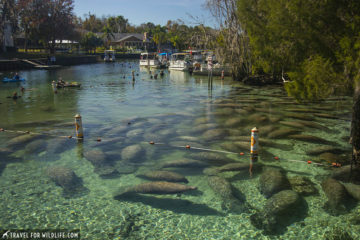 Our favorite site is number 10 where you have the river on one side and the forest on another side. Plus, if you are lucky the elk may appear and pay you a visit! 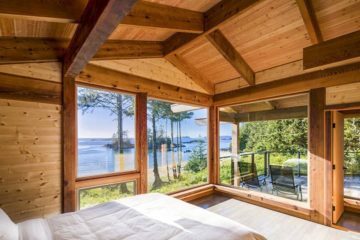 If you are looking for a cabin, check out our post on Gatlinburg cabins you can rent. 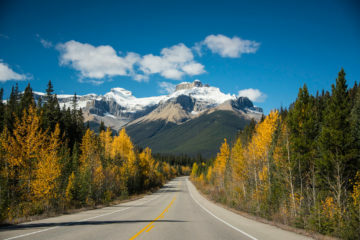 It is a bit of a drive, but great as a base for your Smoky Mountains vacation. You must be wondering how we managed to get this shot as we are not allowed to get close to the elk. Hmm…this is a self portrait! We left our camera on a tripod shooting a time lapse at one frame every two seconds and this elk came by to check it out. You can now watch the video we made of the Elk Shooting a Self Portrait. Tip: Many of the elk have radio collars and ear tags. Orange tags mean the elk was born in the Smokies. Yellow ear tags mean it is one of the original elk introduced from the mid west and white tags mean it is one of the original elk introduced from Canada! 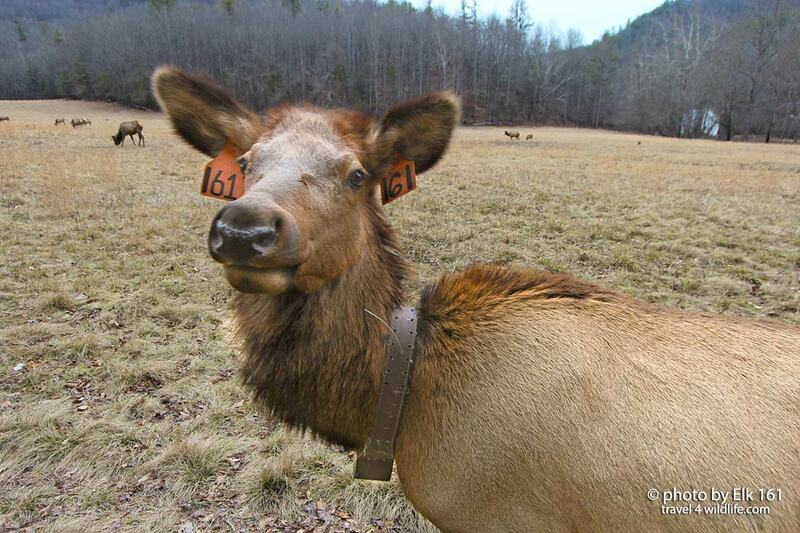 Have you seen the elk in the Smoky Mountains? Tell your story in the comments below! Great story and photos, guys! So jealous you got to see them in full rut, and out in the open. Guess that means we’ll just have to come back in the Fall, huh? You must! You must! The males are so impressive! They are also really active as they follow the females everywhere. 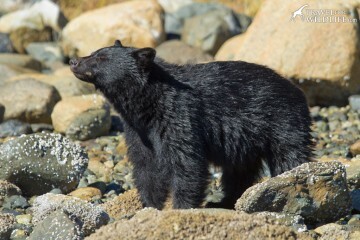 We are going back this Tuesday in the hopes to also see a bear cub (or two…). Wow. 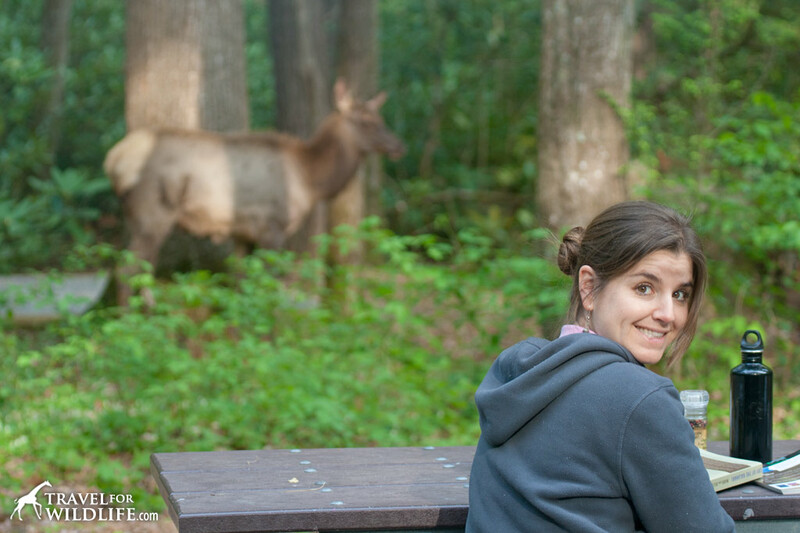 I’ve seen elk in BC, Alberta, and the Grand Canyon, but I had no idea I should even look for them in the Smokies! We were there in the early spring last year, probably too early to spot them. We’ll have to return in the fall sometime. And the campsite looks amazing… Thanks for this! You are welcome! The fall will be a great time to see them!